It is bad enough that I have anxiety attacks at the thought of my daughters driving alone but throw in factors like drunk driving and texting and I just want to keep them at home safe and sound. I know that’s unrealistic though, as every parent of teenagers can tell you. We talk and we talk about the risks, the dangers, then we close our eyes and pray like mad that all the talks have somehow sunk in. PLEASE NOTE: THIS VIDEO WAS PRODUCED BY AT&T AND MADE AVAILABLE ON OUR SITE AS A PUBLIC SERVICE. PLEASE CONTACT AT&T FOR QUESTIONS RELATED TO THIS VIDEO. THANK YOU. this is not easy to watch, but watch it. it will make you think before you start texting while driving. it will make you think before you get in a car with someone who is texting and driving. and, i hope – it will make you STOP texting with someone that you know is behind the wheel. please – share this with every parent you know, and with every “text addict” you know. this video was produced in march, 2010 by AT&T. Share this video with everyone you know. It’s not only the kids who need reminding, even adults who should know better have been caught texting while driving. No phone call or text message can be so important that it can’t wait until you’ve stopped the car. I am no stranger to driving buzzed. I’ve done my share of them, I am ashamed to say. When you’re young and think you can do anything, driving buzzed is not unusual; sometimes it is even a badge of honor of sort. Forward a few years later, I’m older, a little wiser and more importantly I am now a mom and I realize what an idiot I was! I was lucky I never got caught driving buzzed or, god forbid, got into an accident. Some of my friends were not so lucky though. A number of them were cited for driving under the influence and some got into minor fender benders. However, I remember at least two incidences when catastrophic events/accidents occured and my friends were never the same after that. One is paralyzed for life and the other is now mentally impaired. Sure, people will say, it could have been worse; they could have died or worse, killed someone. Regardless of how you look at it, buzzed driving IS drunk driving! Designate a sober driver before you leave for your event. Be ready to take alternate transportation such as a bus or taxi. Have the phone number of a taxi service stored in your phone before you leave for the party. keep in mind that in 2008, 1,179 people in other vehicles were killed in crashes involving alcohol-impaired drivers. Global Influence is working with the National Highway Traffic Safety Administration (NHTSA) and the Ad Council as they continue their efforts with the Buzzed Driving is Drunk Driving PSA campaign. 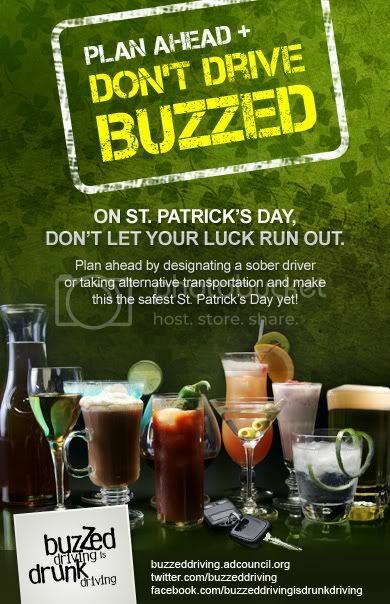 Buzzed drivers drink and drive, but do not consider themselves a hazard on the roadway because they have had ‘only a few’ drinks. The campaign hopes to educate people that consuming even a few drinks can impair driving and that Buzzed Driving is Drunk Driving.